A major part of authentic Mexican cooking is its myriad sauces -- salsas, moles, pipianes, etc. In this wonderful book, Roberto Santibanez focuses on the sauces and provides recipes for virtually every one you can imagine, and many more that will probably be new to you! The only comparable book I know of is Patricia Quintana's still untranslated "El Mulli." 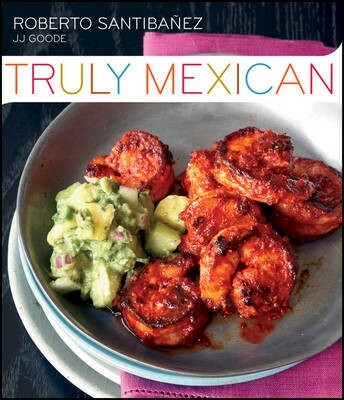 A great addition to the library of Mexican cookbooks! Most of these are traditional sauces that can be used with your choice of meats, fish or poultry. In the old days Mexican cooks often had to use whatever protein was available. There might not have been a big selection at the market, but what there was could be varied infinitely by the endless array of sauces. So feel free to experiment, using these sauces. Whatever you cook in them will be delicious! I made this for a coworker's birthday party. I appreciate that it keeps in in the refrigerator for a few days, so it can be made ahead. Everyone enjoyed it, and two people asked for the recipe. I used less jalapeno, so it was not as spicy. The salsa is runny, similar to Mexican restaurants in the U.S. I liked this tomatillo salsa; the ancho chiles gave it a smokiness. I used 1/2 pound of tomatillos, which only made about 1/4 cup salsa (not the 1/2 cup the recipe indicated). 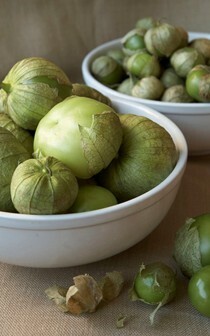 I would purchase at least 1 pound tomatillos to produce 1/2 cup salsa. This is a really simple and delicious recipe. The chipotles add a bit of heat and smokiness, while the tomatillos keep it tangy. Versatile... and a little different from the usual salsa. So, I made this salsa and then mashed in 1.5 avocados. It was a big hit! I served it with tortilla chips along with Rick Bayless Frontera grill chipolte salsa (jarred) I chose to do the tomatillos in a cooked salsa. I've never had them in a fresh salsa, for some reason I don't think I'd like that. Out of the ballpark guacamole recipe! Will make again and again. Must make in a molcajete which is perfect for this recipe. I am considering keeping the chopped onion, cilantro and chilies on hand so we can make this easily and often. This is my go-to guacamole recipe for classic guac. If you add fresh lime juice, it keeps (in the refrigerator) without changing color. I always add fresh tomatoes. Meh. I didn't think the cucumber added a lot and I found the pineapple too sweet. I found this recipe especially simple to make, and very flavorful. The Guajillo chilis add just enough heat so that people with most levels of heat-sensitivity can enjoy. Take your time in making sure the chilis are properly browned to get the best flavor. Small batches work best. This is a really great marinade. Well-balanced. Made this with the 3-chili adobo, and it was absolutely wonderful. Served with tomatillo salsa (fresh, not cooked) and cucumber salsa, along with corn tortillas. As expected, this took a lot of work, including an extended break dealing with my smoke alarm after the chile frying step. (Sigh.) Still, the mole came out delicious and extremely complex, which was very gratifying. This recipe makes an absolute vat (completely filled my dutch oven), but it'd be hard to cut it down, so I'm hoping it freezes well. I really liked it enchilada style with chicken (poached using the book's method) and chihuahua cheese. This was FANTASTIC. I was really attracted to the picture in the book (with shrimp), but had to use chicken breasts instead. I poached them using the method in the book and then saved the liquid for the sauce. I overcooked the chicken (I got a phone call), but the sauce is so good it didn't matter. I made it pretty much as written, though I used only one whole large jalapeno. I could have used a bit more, but it was still plenty spicy. Next time, I would add less liquid while blending the first batch, just to get a smoother texture. I originally planned to serve this with tortillas, but after tasting, I decided to make rice to sop up the sauce. Super delicious. Used the carnitas recipe from the book and already made pico de Gallo from the freezer. Great with chopped onions, cilantro, and squeeze of lime. I really liked this, but felt it needed more filling. Maybe sautéed veggies in with the chicken. I really liked the technique of making the corn tortillas pliable. I think this recipe is very flexible. This is an outstanding salsa. I only made the salsa and without the meat. I used it to coat corn tortillas and also to top pork chops. This is a keeper! I made this for a birthday dinner. There are a few parts to it, so be sure to get organized! A fantastic meal. Fabulous! I made this with the fresh Ranchero Sauce from the same book. I brought back memories of my days living in Los Angeles in the 1970's. I used them as a side dish, but they'd be perfect for breakfast with a fried egg on top. Excellent carnitas. Made half the recipe, subbed buttermilk for condensed milk, and shredded meat with fork before crisping/browning in the oven. Was not sure if orange skin also went into the cooking sauce and added that in as well. I thought these were good, especially considering how simple they were to make. They had a smoky, deep flavor. Great weeknight option. Incredibly rich, complex, and spicy. My go-to Mexican bean recipe from now on. Wow! Wow! Wow! The title describes it perfectly. It is more than just a celebration of Mexican food. It is more than just a lot of Mexican recipes. It is the print-equivalent of total immersion.